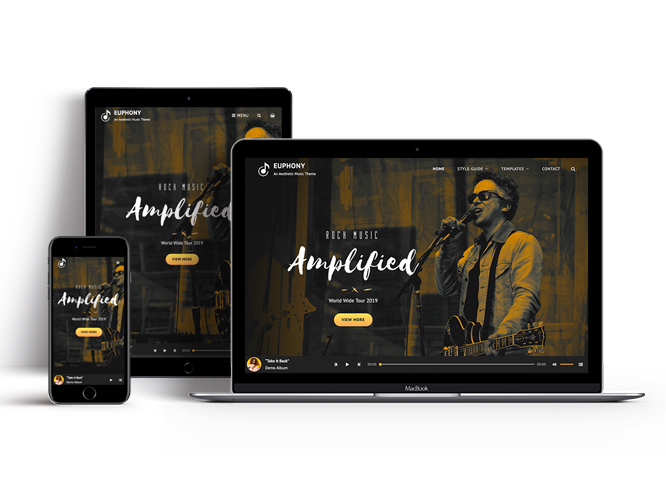 Euphony is a free music WordPress theme crafted beautifully for musicians and bands. It comes with a minimalistic, interactive and super elegant concept. Euphony has been made to be versatile within the music industry and fun to play with. This theme is power packed with astounding features like Featured Content, Featured Slider, Hero Content, Sticky Playlist, Services, Portfolio, Testimonials, and more. 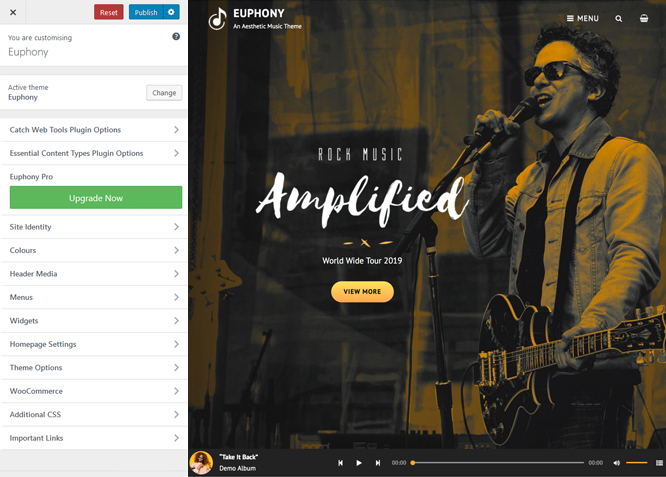 All of these features in Euphony allows you to tweak your music website the way you like. 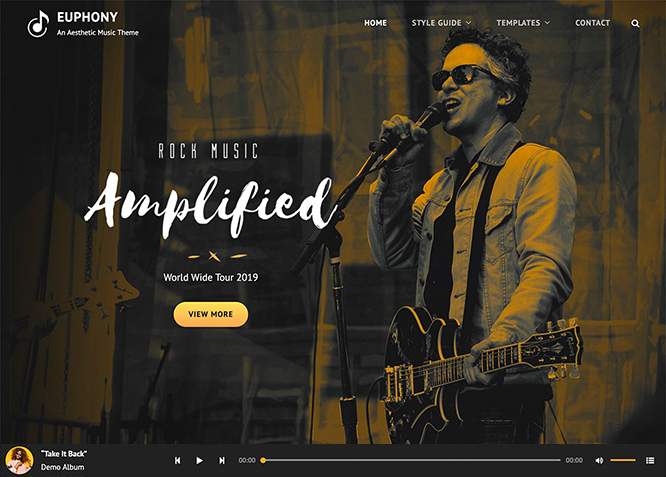 Euphony is an ideal solution for musicians, solo artists, bands, podcasts, music blogs; you just name it, the theme helps you realize all your ideas. The theme is completely responsive and thus compatible with all kinds of modern browsers. To top it all, the theme is translation-ready. If you want advance music features, check out the premium version, Euphony Pro. Euphony supports Custom Post Type(requires Essential Content Type Plugin ). For Featured Content Options, go to "Appearance => Customize => Theme Options => Featured Content"
Euphony supports footer background image. Go to "Appearance => Customize => Theme Options =>Footer Background Image" to change footer background image. Euphony has 2 Default Layout, 2 Homepage/Archive Layout to choose from "Appearance => Customize => Theme Options => Layout Options"Default Layout Once you are in Layout Options, you can Check the box below "Default Layout Options" which will set our site layout. Further, you have the choice of selecting custom layout for individual pages and posts through "Euphony Options => Layout Options", which you shall find below individual posts and pages, when you click on them for adding/editingSingle Page/Post Image Layout Once you are in Layout Options, you can Check the box below "Single Page/Post Image Layout" which will set our posts/page image layout. Further, you have the choice of selecting Single Page/Post Image Layout for individual pages and posts through "Euphony Options => Single Page/Post Image Layout", which you shall find below individual posts and pages, when you click on them for adding/editing. Euphony supports Custom Post Type as portfolio. Euphony supports Custom Post Types as services. For Services, go to "Appearance => Customize => Services". Euphony supports Custom Post Type as testimonials. Euphony currently has 4 widgetized (Sidebar) areas thay are: 1. Sidebar, 2. Footer One, 3. Footer Two and 4. Footer Three. Go to "Appearance => Widgets" or "Appearance => Customize => Widgets" in WordPress. Euphony supports CT: Social Icons. You can add widget in widget area as per your need.